How To Make Your Own Vanilla Extract | I Wanna Bake! Making vanilla extract could barely be easier, and if you like to give homemade presents during the holidays, it may be right up your alley. It’s true that the materials cost more than it would to just buy the same volume of vanilla extract from the store (admittedly I haven’t done the math on that, but it cost me about $54 before discounts to make 750ml), but the flavor of homemade vanilla really is better than the store-bought stuff. I made three eight-ounce bottles of extract, but you can easily do this in smaller bottles to spread it around a bit, if you can find the right sizes. 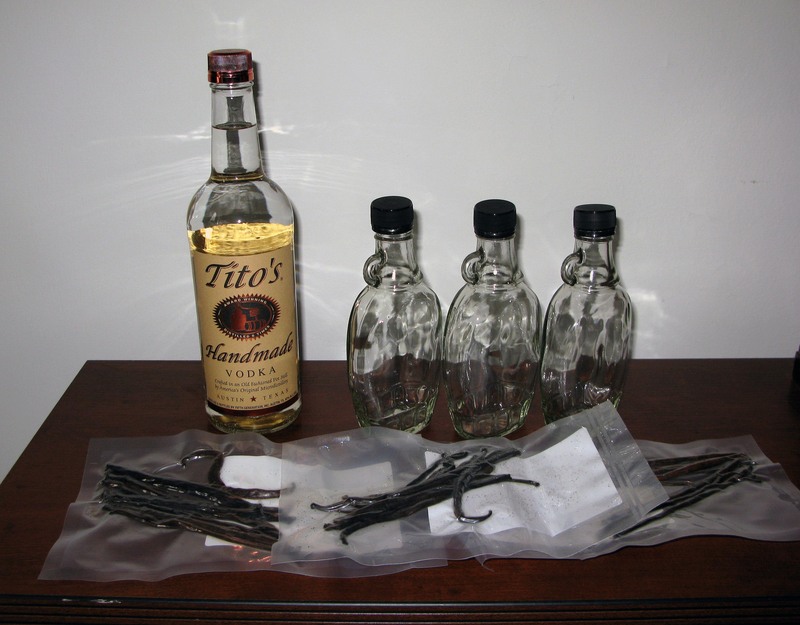 If you don’t want to do this on quite such a large scale, there is an even easier way: just buy one of the little bottles of vodka you can find behind the counter at the liquor store and two or three vanilla beans, cut the beans, and stuff them right into the bottle. I did this as well, and that cost about $10. You can see how that turned out in the pictures below. 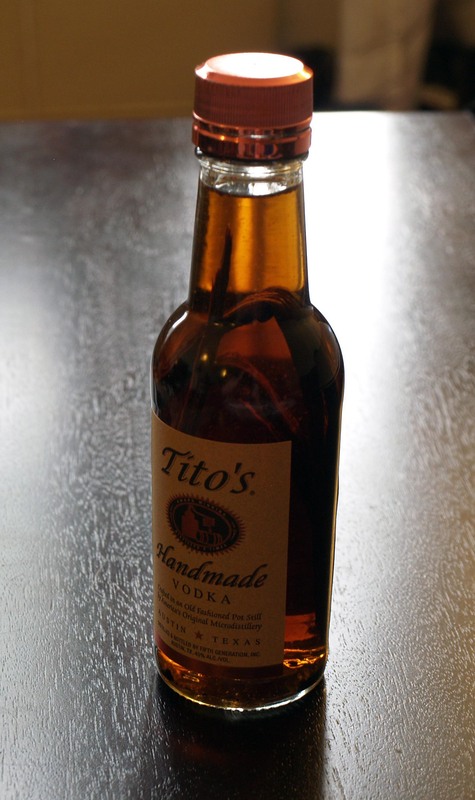 I used Tito’s vodka, mostly because the grocery store had a convenient-sized bottle for sale right on the counter by the register (it seems their marketing worked as planned) when I was looking for test run materials. I liked the result, but yours should be similar with any non-flavored vodka that’s not quite bottom shelf. I wouldn’t waste the money on expensive vodka, because the important part of this endeavor is the vanilla, not the liquor. I will note that I’m by no means an alcohol connoisseur, so take my recommendation on this with a grain of salt. If you want to get fancy with this, you can do other crazy things like add a cinnamon stick or other spices to the bottle, or try it with other liquors, like bourbon or rum. I’ve got some plans for a bourbon mint extract down the line. If you try something creative with your extract, let me know how it turns out in the comments. However you choose to do it, though, it takes about 2 months to fully infuse the vanilla flavor, so get started now! First and foremost, be sure to wash your intended containers. You don’t want any foreign contaminants ruining your extract. If you are using B-grade vanilla beans as suggested, chop the beans into ½”-2″ pieces and distribute them evenly between your containers. If you use grade A vanilla beans (which is what you’re more likely to find in stores), instead slice each bean lengthwise, then stuff the halves into the jars. Either way, if you would like, you can leave one whole vanilla bean in each container for presentation. Using your funnel, carefully fill each container with vodka to within ¼” of the opening. Seal the containers tightly and give each one a good shake. Store the bottles out of direct heat and sunlight. Shake the bottles weekly to ensure that the vanilla is distributing throughout the vodka. It’s not absolutely vital to adhere to this schedule strictly, so don’t worry too much if you miss a week or shake your bottles early. [I wrote “shake vanilla” on every Tuesday on my calendar for the rest of the year, and I still forgot.] Just do your best to remember. After two months have passed, your vanilla should be ready to use. Crack it open and take a good whiff (I promise, it’s magical). You’ll know it’s ready because it shouldn’t smell overpoweringly like vodka anymore. I like to leave the vanilla beans in the bottle so that they can keep contributing flavor, but if you would prefer, you can strain them out using a fine-mesh strainer. If you leave the beans in, you can top the bottle off with vodka from time to time to keep your extract going. 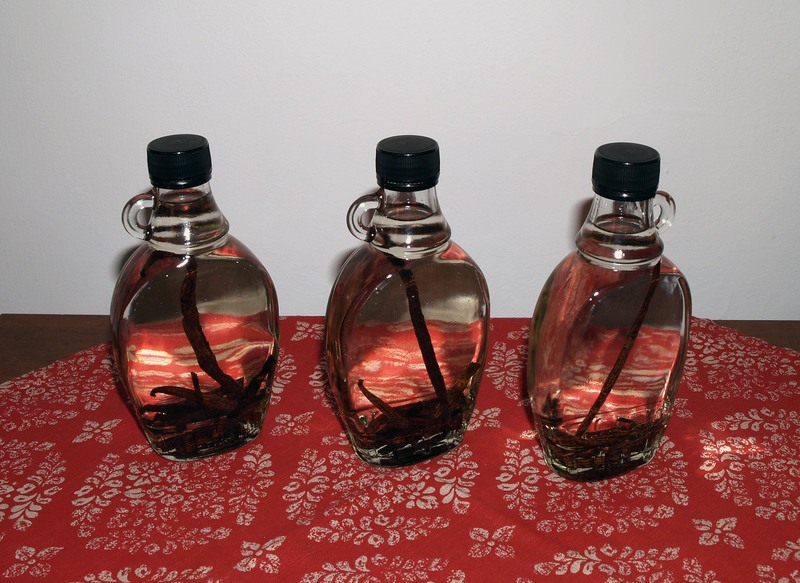 Use your homemade vanilla extract in recipes exactly as you would use the store-bought stuff. Perhaps in a recipe from your favorite blog (wink wink).